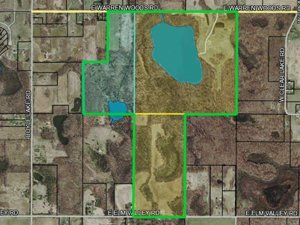 All Southwest Michigan Real Estate with emphasis on Lake Michigan lakefront property, waterfront property, and large parcels of scenic acreage suitable for development. This website is updated in real-time with the most complete list of MLS listings, sorted by neighborhood, property type, days on market, and price. 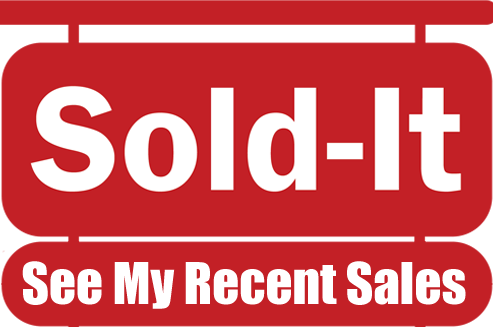 Sold and expired listings are removed automatically and immediately. That's only one reason why so many people interested in Southwest Michigan real estate prefer TheDailyListings.com over Zillow, Trulia, etc. We now serve up nearly 3,000,000 page views per year! Most $1,000,000+ sales in my market! Don't waste time with old listings on Zillow, in print, etc. I'll show you every property that matches your needs. "I've been helping vacation home buyers locate and buy Southwest Michigan real estate for more than 25 years. I began publishing this website along with TheDailyListings Newsletter in 2004. Since then, it's become the most frequently visited website of it's kind, and is read by thousands of unique visitors each month. The weekly newsletter recently celebrated a new milestone, registering it's 15,000th subscriber. Even more exciting, since the beginning of 2016, our website analytics show that we are on track to shatter all previous records by delivering more than 2,000,000 Page Views before the end of the year! 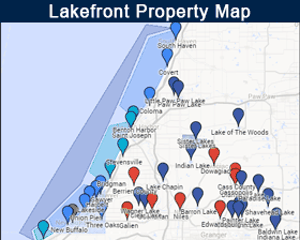 "TheDailyListings.com is the best website for lakefront property in Michigan. Period. Nothing else is even close. Paul’s combined level of knowledge, expertise and integrity is refreshingly high in an industry which seems to have many agents that lack all three. He is the only Buyer's Broker I would use in Michigan." See more client reviews and testimonials. Lake Michigan or Inland Lake? This should probably be the first decision you need to make. If you envision a dock in your backyard overlooking the lake you plan on spending the summer waterskiing, riding watercraft, or relaxing on your pontoon boat, you will probably eliminate property on Lake Michigan from your search and focus on one or more of Southwest Michigan's All Sport Lakes, for example, homes for sale on Diamond Lake in Cassopolis, MI or homes for sale on Paw Paw Lake, in Watervliet, MI. If your plans include buying Lake Michigan lakefront property, carefully assess your priorities to determine if you value a low bluff for easy access to a wide sandy beach, or if your main reason for wanting a lakefront home on Lake Michigan is the beautiful views and setting that only a lakefront home on a large lake can provide. The cost of homes for sale on Lake Michigan will largely be determined by the quality of the beach, the height of the bluff, and the relative convenience and ease of accessing that beach. Call me if you would like to discuss the pros and cons of each Lake Michigan lakefront home or location to determine which are best suited for you and your family. Have you considered renting your vacation home when you are not using it to offset the cost of owning it? The Southwest Michigan vacation rental market is very strong with many properties booked over a year in advance. We can help identify the properties that will fit your lifestyle while earning the best return on your investment as a vacation rental. Our in-house team of web programmers and Internet marketing specialists can set you up with a turn key website with professionally photographed images of your property. We will directly linked to your own VRBO account for prospective vacation renters to make reservations and collect payments online, automatically and securely. You might really be surprised when you learn how efficiently a rental home can be managed. If you execute a bit of careful due diligence when selecting the right property, you should also enjoy a very nice return on your investment. You Deserve Your Own Broker Without Bias or Conflict of Interest. Do you need help determining which properties listed for sale in the MLS are best for you? Ask me. Since I rarely represent sellers, I can provide you with my honest assessment of each property without bias or conflict of interest. Don't know where the lowest bluffs are located? I do. "You’re not just buying a house; this is your life." Not sure if there are any environmental issues to be concerned about, like high risk for erosion, possible loss of beach, or worse (see Lake Michigan Home Disappears)? I'll know or I'll know the experts to ask. 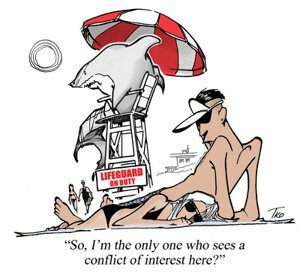 Are you uncertain about the difference between riparian rights, littoral rights, deeded beach rights, etc...? I work through these issues daily as I've helped hundreds of out of town buyers just like you locate and acquire waterfront property throughout Southwest Michigan and nearby Northwest Indiana since 1987. 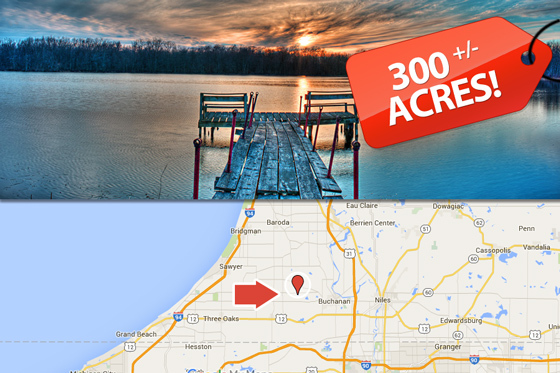 Are you interested in finding property for sale on one of Southwest Michigan's lakes? I've got you covered. 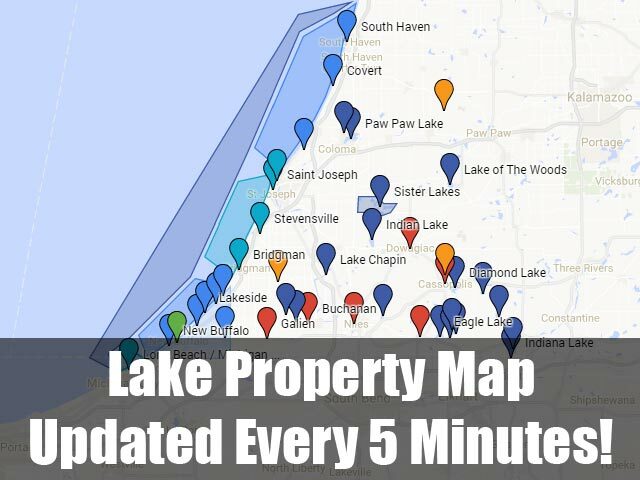 Click on the map to the left to see a full page map of Southwest Michigan including links to all waterfront homes for sale on each lake. Our market covers all real estate for sale in Berrien County, Cass County, Van Buren County and the south half of Allegan County. I work with very experienced agents who spent their entire lives around these lakes. As veteran real estate agents, they know which lakes are the best for your needs. For example, if you enjoy water sports, skiing, riding watercraft like waverunners and jet-skis, they will be able to show you the best lake homes for sale on all sport lakes in Southwest Michigan. If you prefer a more quiet and relaxed atmosphere, they will be able to show you property on lakes where power boats and watercraft are prohibited. Whether you envision yourself as a gentleman farmer, a vineyard operator, or just want room to ride horses or ATVs, I helped many, and I can help you, find the property to make your vision a reality. Check out all the homes for sale with acreage. This property is a developer's dream come true. Located 15 to 20 minutes from New Buffalo, MI and Warren Dunes State Park on Lake Michigan in Sawyer, MI you will find a beautiful spring fed private lake, completely surrounded by a 300 acre parcel of land where the beauty of wildlife, pastures of flowering plants, and hardwood forests abound. From north to south the property measures a full mile in length, all the way from Warren Woods Rd on the north end, to Elm Valley Rd on the south. In total, the site features nearly 4600 linear feet of strategically beneficial road frontage; approximately 3300' on Warren Woods, and the remainder on Elm Valley Rd. Contact me about this property. Courtesy of Paul Zubrys with Paul Zubrys. "Paul was great to work with in my search for a lakefront property...." See the complete reviews here. "Paul is always quick to respond and is very knowledgeable about the market in southwestern Michigan. He understands what you are looking for and brings you properties that fit your goals..." See the complete reviews here. "Paul is the ultimate buyer’s resource in Harbor Country. As a unique enclave, most listings are not found on the major real estate apps, but Paul has them all in his constantly updated database. That access was the only reason we were able to find our house...." See the complete reviews here. "We must have visited a dozen or more properties and he was always "no pressure" and would let us do our own thing..." See the complete reviews here. "Paul did a fantastic job as our buyer's agent.....very knowledgeable of this area of Michigan and always available 27/7..." See the complete reviews here. "We saw a lot of properties and he was great at pointing out the pros and cons and was very tuned into what we were looking for..." See the complete reviews here. "Paul was the consummate professional throughout our search for a home..." See the complete reviews here. "We really had a positive experience with you guys..." See the complete reviews here. "I enthusiastically recommend Paul Zubrys to anyone in need of a Michigan real estate broker. Do not waste valuable time. Call Paul first..." See the complete reviews here. "Paul represented us to purchase a home in Union Pier... I’ve bought and sold several homes in the past 10 years and, this is the first time that I’ve liked a broker enough to take the time to write a testimonial...." See the complete reviews here. "Thank you very much for bringing our buyer to us. Don seems like a great guy who will really enjoy the home and property. We really appreciate your support and focus on our home. Getting that place sold so quickly will really help us in our transition out to California...." See the complete reviews here. "Paul recently represented us in purchasing a home. He has great in-depth knowledge of the local market and a solid understanding of all the properties he showed us. His approach to finding our family a home was informative and focused..." See the complete reviews here. "Paul was professional, responsive and an effective Buyer’s Agent through negotiations and close..." See the complete reviews here. "Paul did an excellent job helping us find and purchase the perfect home in Union Pier. 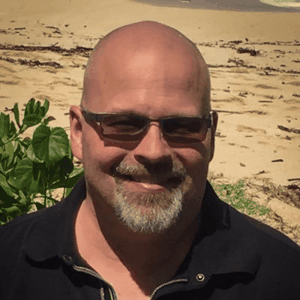 He has insights about the Southwest Michigan real estate market that we were unable to find with any other agent... " See the complete reviews here. "Paul was the perfect agent for us. I’m sure he has been for many people. Our experience with Paul was not common,he went the extra mile for us until (we) were comfortable..." See the complete reviews here.